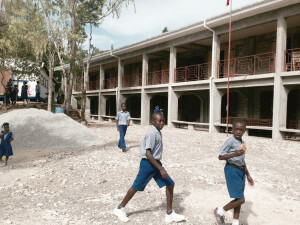 After the original Saint Antoine school was destroyed in the 2010 earthquake, Family Health Ministries raised $100,000 to rebuild the school. 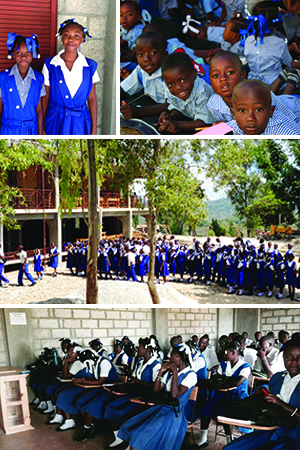 With added financial help from Partners in Progress, Heart to Heart International, and Fonkoze, the new Saint Antoine School building welcomes children back to school in October 2013. The dedication ceremony was held on January 10, 2014 in observance of the 4th anniversary of the 2010 earthquake. “After many years of hard work and dedication, we give thanks for this amazing new school and for all those who helped to make this dream a reality,” says Kathy Walmer, FHM Executive Director. The Saint Antoine School serves 600 Fondwa students grades pre-K through 13 (Philo). The new school is three stories tall with 11 classrooms and administrative space. The Saint Antoine School is a true testament to the parents and teachers who value education in the Fondwa community. The children at the Saint Antoine School are from the very poor, rural, mountainous area of Fondwa and the surrounding communities. Some children are known to walk 2 hours, one way, to attend the secondary school. Family Health Ministries in partnership with Partners in Progress of Ligonier, PA, have been committed to continue to support the teacher and staff salaries at the Saint Antoine School. Family Health Ministries began its student and teacher sponsorship program in 2000. Through the support of 200 donors, Family Health Ministries contributes $2,500 each month to the functioning of the school. Due to the support of our faithful sponsors, we currently have 250 children sponsored. Sponsors are assigned a particular child and are sent pictures and yearly reports on the children’s progress in school, giving sponsors a personal connection in Fondwa. FHM hopes to expand its program by finding sponsors for all 600 children in the school. For just $30 a month or $360 a year, you can provide hope to a child to receive an education that so few children in Haiti ever dreamed could be a reality in their rural home land. Since 2000, Family Health Ministries has provided financial and spiritual support for Fatima House Orphanage. Under the direction of the Sisters of Fondwa, the orphanage is home to over 60 children ranging from infants to young adults. Family Health Ministries provides financial support to the Sisters to help meet the needs of these children. Many of the children at the orphanage are not orphans in the traditional sense, but instead their parents have turned them over to the Sisters’ care because their families are unable to provide appropriate food and shelter. All school-age children attend the adjacent Saint Antoine School. Family Health Ministries works to pair these students with sponsors in the USA through our Student Sponsorship Program.